Another WIP on the completed list, I am so happy with myself for sticking to my resolution to get on top of my project stash. 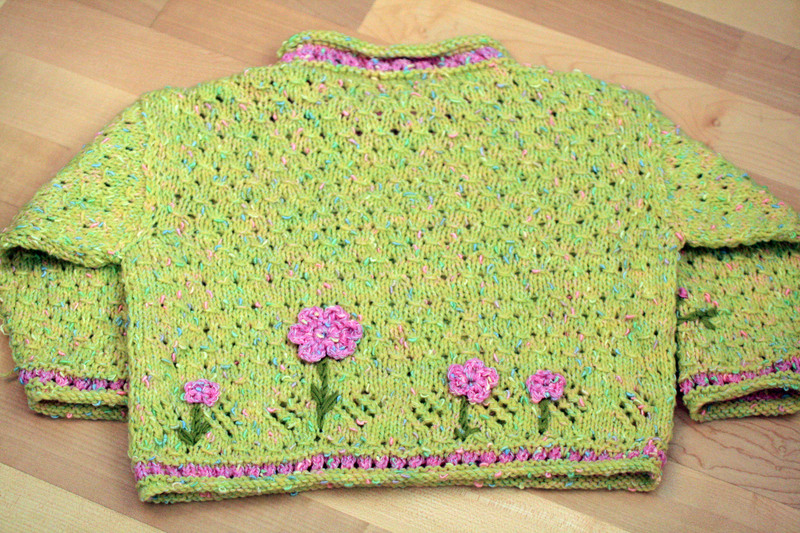 This one is a jumper for little Miss E and it has been sat in the box for far too long! All it needed was sewing together and the neck knitting. I got that bit done and then had some fun with flowers. I love making little flowers, then a touch of embroidery to complete the stems. As usual I was making it up as I go and having used a variety of sizes on the front I decided to try a greater contrast in size on the back. I really liked how this looked and wished I had done it on the front but it was too late to go back and start undoing so, to add to the front I thought a little something on the sleeve may work. Actually it is for an 18 months old child but I guess it could be made in an adult size and why not. 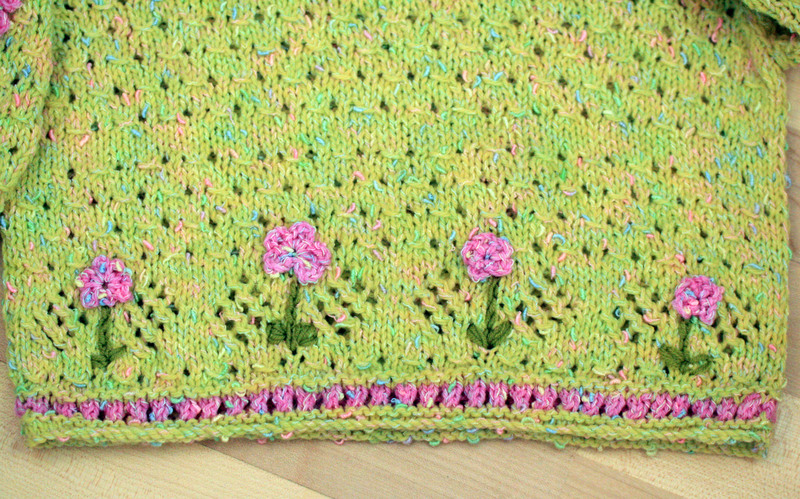 I made a sweater for a friend a few years ago (pre-blogging days) and I knitted a tree onto the back and flowers on the front then embroidered onto it to give emphasis to the stems and apples onto the tree. I think I might ask her if I can take a photo to share. My favourite things to make, thank you. Wow, I love this sweater! What beautiful work! 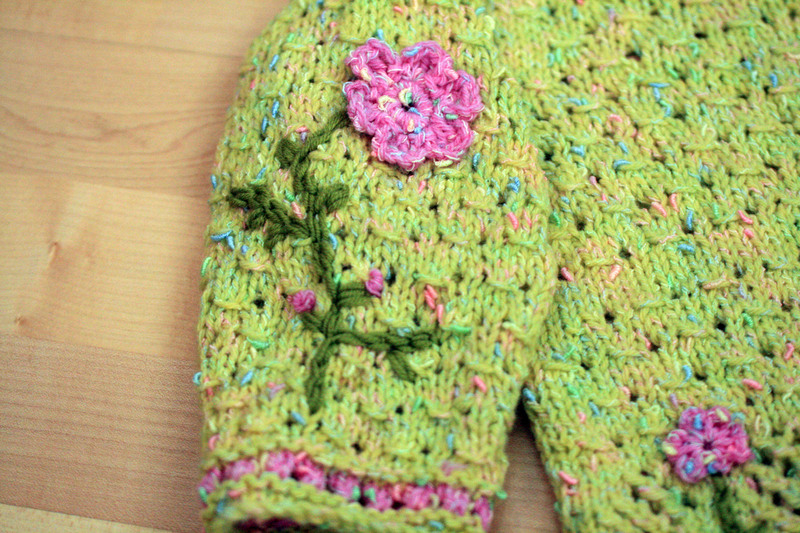 Thank you for visiting and liking this jumper, it was fun to play with the flowers. I am a little sad as it will going to Miss E this weekend but having said that I am also looking forward to seeing her wearing it this Autumn too. Love everything about this sweater! You’ve done such a fantastic job with it! Thank you so much, I do so love making flowers and playing with this kind of freehand embroidery. Looks fantastic! Congrats on completing this WIP! Thanks, great to have another tick on the list. How sweet are those flowers! Love it! Thank you, I had so much fun with it too. This is absolutely gorgeous. I love the flower detail, especially on the arm. You can beam whenever you see her wearing it. Unfortunately she lives away from us but they send photo’s so I do get to see her wearing things. Oh yes, so good when you can “that’s another one done”. this is so so pretty.. great job! Thanks, I am so happy with how it has turned out. Congrats on a finished project! It’s cute! I love the embellishments. I know what it’s like to have an almost finished project sitting around. It feels so good to finish it! You are so right, I really need to feel inspired to pick a WIP up and finish it. I think sometimes in your mind you didn’t finish it for a reason and you always feel it as a negative, which is not always right. Thank you, I love the little flecks of contrasting colour in this yarn. It is beautiful! Congrats on finishing the project! Thank you, I saw you are de-stashing too. You bet! I am getting through them though. My mind is racing with all the new things I will be able to start soon. 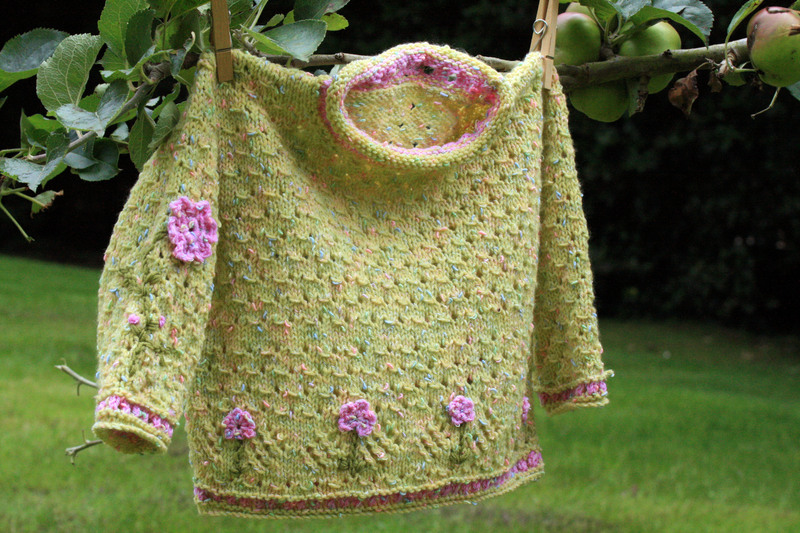 Thank you, I was thinking about all your green things as I pegged the jumper onto the apple tree.